Contributing editor Anna Watson Carl and her husband needed a healthy getaway before he began a rough medical treatment. They found it in Miami Beach. Yes, really. 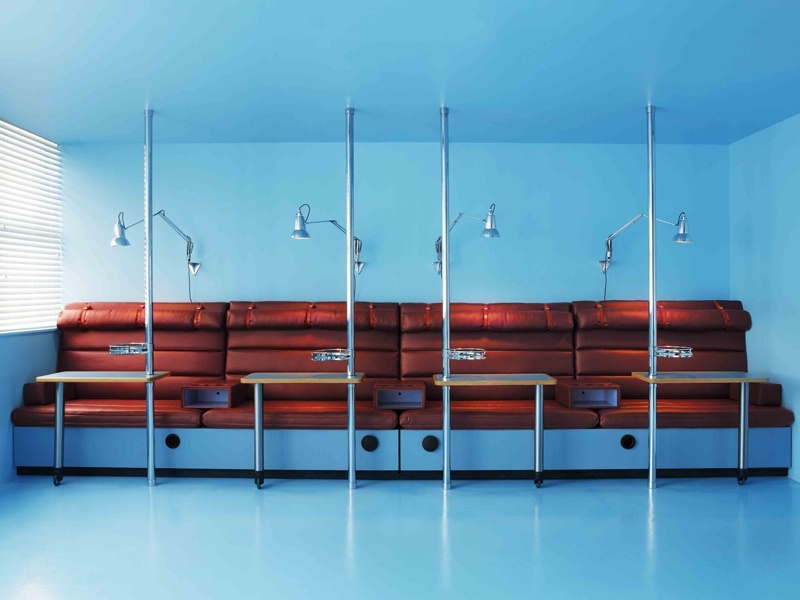 At The Standard Spa, health is not an afterthought. 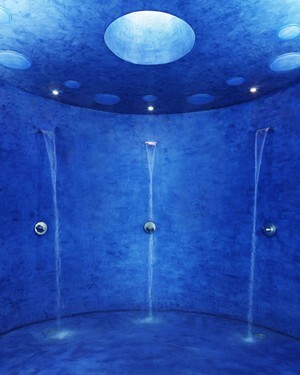 It's a yoga-massage-pool-hamam lifestyle. MIAMI – When my husband and I announced to a few friends that we were going on a detox trip to Miami, it raised a few eyebrows. I suppose it sounded as preposterous as, say, heading to Vegas for a contemplative prayer retreat or to Rio to write a doctorate thesis. South Beach, with its thumping club music, free-flowing booze, and year-round spring breakers, isn't exactly what most would consider an ideal spot for a restful, health-focused vacation. But that's exactly what we had in mind. For years, my husband has suffered from chronic Lyme disease. Though we've tried not to let this fact define our lives, when pills and needles and ten-hour day trips to specialists (not to mention a litany of unpleasant aches, pains, and neurological symptoms) are a part of your day-to-day routine, it's hard to ignore. After trying every treatment under the sun, his doctor said it was time for IV therapy. We were told that a PICC line would be inserted into an artery in his arm, threading into his heart, so that the antibiotics could be absorbed immediately into his blood stream. He'd need daily infusions, as well as weekly nurse visits to clean his line. As we let the rough news sink in, we decided we needed a pre-treatment getaway. If we were going to go through this, we might as well do it with a tan. What we had in mind was a sort of modern-day "taking the cure" vacation. Europeans in the 1800s flocked to spa towns seeking not only rest and relaxation, but also real healing. They believed that hot mineral waters and fresh air could cure a litany of ailments, and I've always been curious as to whether there was some truth to this belief. We wanted to find a health-centric hotel with yoga and organic food and holistic spa treatments. Natural hot springs would have been nice, but we decided we could make do with an infinity pool with a bayside view. Secretly, we both held on to the hope that maybe, just maybe, after a week rest and sunshine and healthy food and spa treatments, he wouldn't need IV therapy after all. A crazy whim, but one we were willing to indulge. The lobby. Photo: Anna Watson Carl. 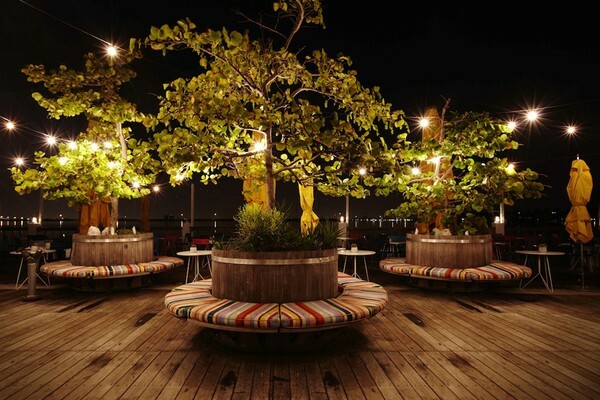 The garden at the Standard. Photo: Anna Watson Carl. 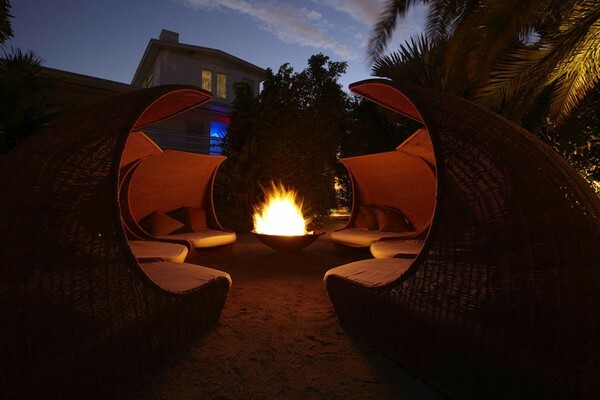 Our destination for this little health experiment was The Standard Spa in Miami Beach. 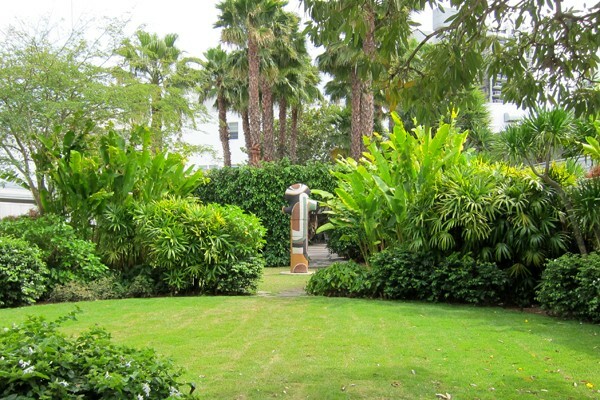 Tucked away on the residential Belle Isle on Biscayne Bay, the hotel is a five-minute drive from South Beach but feels light years away. 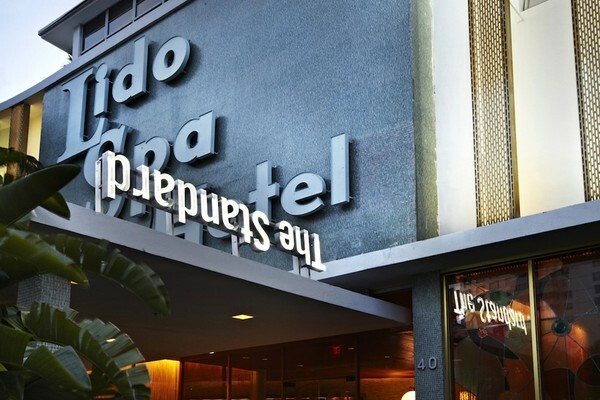 Partially hidden by trees, the hotel still bears its original name, The Lido Spa (a remnant from its days as a popular snowbird retreat in the 1950s and '60s), along with the traditional upside-down Standard logo. The 105-room hotel re-opened in 2006 after an extensive André Balazs makeover. 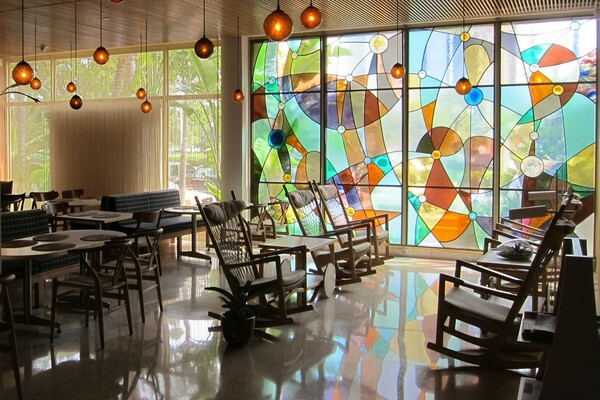 A retro feel remains, from the mid-century modern lobby, with original rocking chairs and stained glass, to the small, minimalist rooms surrounding the garden courtyard. Our room, in the Bath Terrace Medium category, was simply done in whites, beiges, and blonde woods. It had a private patio and with a deep soaking tub sectioned off by billowing white curtains. I could think of worse ways to spend a week. More and more hotels are jumping on the health bandwagon, with amenities like in-room yoga mats, in-house personal trainers, and kombucha-stocked mini bars. At The Standard Spa, health is not an afterthought — it's a lifestyle. With nearly 100 items on their spa menu, guests can completely personalize their experience, whether they want to do a juice cleanse, meet with a life coach, schedule an acupuncture session, sweat it out in the sauna, learn to meditate, or take an aero-yoga class. "We're basically a spa with hotel rooms," explains spa director Mina Gough. "We're a little bit upside down, like the sign," she laughs. With her alabaster skin, piercing blue eyes, and cascade of ash-colored curls, Gough is the picture of health. She was drawn to The Standard Spa not only for its excellent services but also for its playful vibe. "The property is magical," she says. "We don't just keep the treatments in the spa, we take them into the property." Outdoor massages, mud baths, hydrotherapy, and sunrise yoga: They try to make the experience as holistic as possible. In our case, Gough suggested a few treatments right off the bat. For my husband, she recommended a cranial massage to reduce his jaw pain and headaches, and the soothing Turkish Hammam Rub and Scrub — a coconut milk bath and a salt scrub performed on heated marble. For me, she recommended a one-hour Standard Massage to relieve my upper back tension and the Repairer Energy facial for muscle lift and skin cell repair. Steam room. Photo: Nikolas Koenig / Courtesy of The Standard Spa. The pedicure room. Photo: Nikolas Koenig/Courtesy of The Standard Spa. 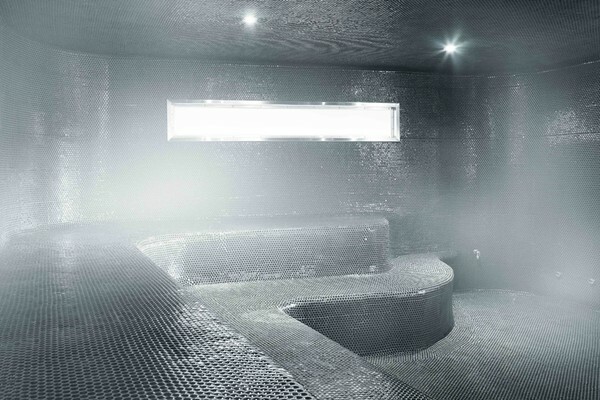 In addition, she advised daily hydrotherapy on the outdoor circuit that includes pools of varying temperatures and stints in the steam room, sauna, and hamam. Last but not least, we were told to do one mud treatment, a couple of yoga classes, and to drink lots of water. Now this sounded like a schedule I could handle. Over the course of our week-long stay, we did every last thing the doctor (so to speak) ordered. The spa treatments were top-notch. Truly, I have never had a better facial: My skin glowed for weeks. We spent lots of time in and around the palm tree-lined pool (which can turn into quite a scene on the weekend) and did the hydrotherapy daily. The restaurant. Photo: Adrian Gaut / Courtesy of The Standard Spa. We ate lunch in the excellent — though very pricy — waterfront Lido restaurant. With super-fresh dishes like whole grilled fish, sprouted grains and greens salad, and an olive- and feta-topped flatbread pizza, eating healthy was a cinch. We napped in the garden cabanas and made use of the soaking tub outside our room. I attended several sunrise yoga sessions overlooking the Bay — they were great. We took walks and jogs around Belle Isle and ventured into Miami a few times to eat at our favorite spots: Michael's Genuine Food & Drink, Joe's Take Away (the more casual version of next door Joe's Stone Crab), La Sandwicherie (baguette sandwiches with incredible homemade mustard sauce), Gigi (for fantastic pork buns), and Crumb (Michelle Bernstein's delicious Design District breakfast spot). But above all, we relaxed. We enjoyed being together and taking a break from the day-to-day realities of living with a chronic illness. The detox treatments and all the time spent outdoors made a noticeable difference in how my husband felt. We came back rested and renewed and ready to face the next step of his treatment. Though there was no miracle cure (as we had not-so-secretly hoped), the IV's suddenly didn't seem so daunting. Maybe once his treatment is done, we'll celebrate in Vegas. Or Rio. Anna is the author of theyellowtable.com. You can follow her on Twitter at @theyellowtable. She lives with her husband and two cats in Manhattan. She travels for the culinary inspiration.